The record was released in vinyl form in time for Record Store Day this past April. But, it’s due to be released in all forms on October 30th – next week! 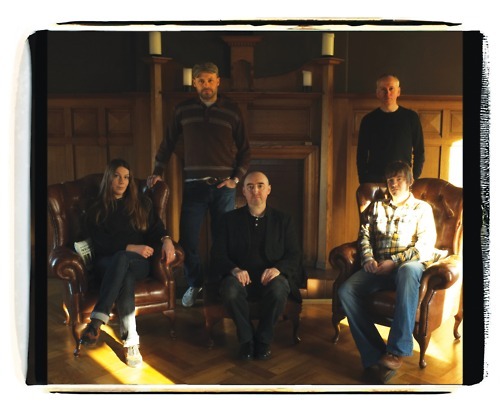 The band who created it enjoy an impressive pedigree, featuring members of both Soup Dragons and BMX Bandits (represented by guitarist and songwriter Jim McCulloch) and the mighty Teenage Fanclub (specifically guitarist Raymond McGinley). Dave McGowan (Isobel Campbell, Belle & Sebastian) on bass, Stuart Kidd on drums, and vocalist Anna Sheard round out the line-up. The band started off as an acoustic trio, later expanding to a quintet with McKidd and McGinley rounding out the sound and adding in a bit of electricity. The record was laid down in Norfolk, and in their home town of Glasgow. Another Fannies connection is Norman Blake, who contributed to the project, as did noted violinist John McCusker, The Bluebells’ Dave McCluskey and Giant Sand’s Peter Domberknowsky. Not too shabby then, personnel-wise. But, what stands out for me immediately is Anna Sheard’s voice. Hers is an instrument that effortlessly captures the spirit of late ’60s and early ’70s British folk-rock, with a purity of delivery that evokes similar tones of Jacqui McShee of Pentangle in particular. Incredibly, before she was discovered by McCulloch on Dave McGowan’s recommendation, Sheard had no history of performing other than in her kitchen. Having said that, Sheard’s contribution is in a unique context, supported by the singular musicianship of the other members of the band who understand how pop songs are constructed, no matter what era they’re created in. Speaking to Anna and band founder Jim McCulloch via email, I asked about the unique origins of this band, and about the level of honesty and dedication that drives it. Here is that interview. The Delete Bin: Anna’s becoming a recording artist and a front for a band for the first time must represent a life-change. How has it changed the way you thought/think of your own singing as something that is now a part of a group, rather than as something done casually on your own? Anna Sheard: The dynamic of being part of a band and now a recording artist for me continues to be a unique and exciting experience and a process I view as an adventure. I consider myself hugely blessed to have been given the opportunity to sing alongside such musical talents that make up the band. My perspective on my singing now post recording/performing as part of a group really remains as it always did, that singing is just an integral part of me and the only difference being that now more people get to hear it. DB: Snowgoose is made up of musicians who have a histories touring with and being a part of some very successful acts. What kinds of experience played into Anna’s first experience in recording an album? AS: Previously to recording our debut album I had been in a recording studio once before in Glasgow having been asked by Jim McCulloch to sing on two songs for a solo project he had been working on. I can remember my excitement and fear of being in an unfamiliar studio atmosphere for the first time and the feeling of relief and euphoria that I had managed it whilst walking home afterwards. When it came to recording our album at Leeders Farm I felt completely at ease with the people around me and loved the songs Jim had written for the album. The songs naturally developed during our time at the studio and the entire process was a delight to have been part of. DB: How conscious was everyone at the writing and recording stage about making this band a separate entity to what came before? Jim McCulloch: It was pretty much the “newness” of Snowgoose which kept popping up at every turn.Because Anna had never really recorded and performed before,the rest of us were ,and still are,seeing the process through Anna`s eyes.I for one find it very invigorating. There was also the fact that I had written a lot of the material. This was new for me in a group situation,with all the dynamic ebbs and flows that come with working with top-drawer musicians. DB: I’d love to know more about the creation of this specific track. I love that this song is about how Jim felt about the band, and how the sound of it came together so naturally. Was that feeling difficult to capture in a songwriting process? JM: The song “Harmony Springs” came quite late in the process.We hadnt started recording yet, but the studio, Leeders Farm,was booked. Anna, Dave and I tried to make a point of meeting every week to bounce ideas off each other and I had a little riff that suddenly crystallized into a song in what couldn’t have been more than an hour. I had wanted to capture the excitement of us going into the studio and making our mark straight away. I think the joy of celebrating whatever it was Snowgoose was going to be after the studio sessions were done was something worth putting into song. DB: This song is clearly tailor-made for this band. But, did you see any trends emerge as material was being worked up for the record as being particularly “Snowgoosey”? JM: I think we all know our own musical strengths pretty much,and what we all bring to the band is what you hear when everyone has an open remit with absolutely no restrictions on what Snowgoose are “supposed” to sound like. We wanted it to be highly melodic, rich in harmony, and we ended up with an album full of grace, depth, and beauty. DB: Some influences cited for Snowgoose have been the Fairports, Pentangle, and the British folk revival of the 60s and 70s in general. But, I’m hearing a sort of rock/pop pacing in this tune as well. How did you maintain that balance when writing the material, and were there other musical forces that guided the proceedings? JM: I think those folk/rock references are absolutely fair enough,but they are a starting off point rather than the be-all and end-all. We didnt sit down and say “Stu needs to play the drums like this”, or anything like that. I think it just boils down to the fact that it`s a fantastic pop song, which could have been released anytime in the last 45 years or so. In Snowgoose, we are definitely guided by instinct. You can learn more about this band on the official Snowgoose web site. And remember to like Snowgoose on Facebook.